For 20 years, the Strike Anywhere Performance Ensemble has been creating original, community-based and site-responsive work that engages audiences in topical issues. One of Strike Anywhere's prime compositional tools is Soundpainting, the universal sign-language for live composition. The Soundpainting language is comprised of over 1500 signs and allows a conductor/composer to sculpt a performance in real-time with improvising performers of any discipline or genre. The technique was created by N.Y. composer Walter Thompson during the late 1970's for use with jazz musicians. It has evolved into a multidisciplinary language that is practiced in 33 countries. Soundpainting is a radically inclusive form that bridges perceived divisions. 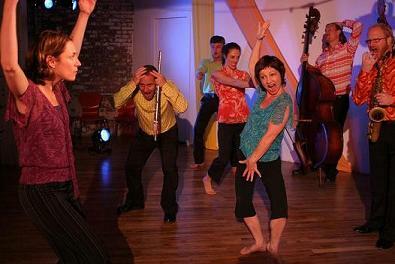 Strike Anywhere has used the technique to unite disparate groups, to shatter the divide between audience and performer, to transcend language in international work and to democratize collaborations between community members and professional performers. SA is the preeminent theatre company in the U.S. practicing Soundpainting. SA's Artistic Director, Leese Walker was the first actress to be soundpainted and is one of only three certified-multidisciplinary-Soundpainters in the United States. SA's musicians are some of the most experienced Soundpainting performers in the world, having worked as core members of the Walter Thompson Orchestra since the late 1980's. Strike Anywhere is available to perform Soundpainting residencies and master classes. The company also creates "themed-Soundpaintings" and can Soundpaint any repertoire that an orchestra, theater company, band, or dance company might want to remix and use as fodder for improvisation. ""Led by founder and director Leese Walker, Strike Anywhere Performance Ensemble merges music, theater, improvisation, and structured composition into a total multi-media experience 'a happening' in which art leaps off the wall and into the seat next to us."" "The Bowie Project" is a collaboration between the Strike Anywhere Performance Ensemble, Austin-based Andrea Ariel Dance Theatre (A.A.D.T.) and the Bowie tribute band The Super Creeps. The performance is a soundpainted mash-up of David Bowie's music, interview quotes and original choreography inspired by the mercurial artist. A series of 16 site-specific performances that took place on the historic pedestrian street Rue Colbert in Tours, France. The project was a collaboration between Strike Anywhere and the Tours Soundpainting Orchestra. The soundpaintings were based on interviews with neighborhood residents and shop-keepers. A collaboration with a 65-member concert band, 15 choir members and 30 actors at Timber Creek H.S. in Fort Worth, Texas. The week-long residency culminated in a performance mash-up of Shakespeare's "The Tempest" crossed with music by Phillip Glass, Stravinski and Ravi Shankar and some pretty funky dance routines! All the material was repertoire that the students had at the ready. Commissioned specifically as the closing event for the Festival, Strike Anywhere tapped its natural resources to create a super-sized Soundpainting examining America's over-the-top obsession with over-consumption! While the trumpeter ate close to a dozen hamburgers after playing a blistering trumpet solo, actors riffed on a series of satiric diet commercials and talk show parodies in a theater filled with the smell of bacon. An improvised composition weaving quotes from interviews, poetry and songs by John Lennon into a colorful multi-media mosaic. Commissioned by the Two River Theatre Company in Red Bank, NJ, this fantastical creation story was specially crafted by the ensemble to honor the town and celebrate the the opening of Two River's new theater. Presented as part of the New Jersey Theater Alliance's statewide event, Family Week. A soundpainted response to the color-coded climate of fear perpetrated by the Bush Regime in 2004.